Lexington, KY—If you asked the Team USA vaulters how they were feeling this afternoon, they’d answer with a chorus of screams. 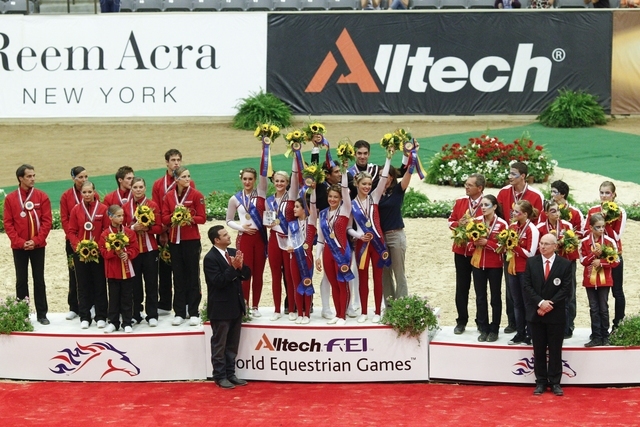 They feel that good, because they pulled out a come-from-behind win to earn the team gold medal at the Vaulting World Championships, held as part of the 2010 Alltech FEI World Equestrian Games. Today was a contrast from the previous team freestyle competition on Friday, when two team members fell from their horse, because, said Maitozo, the team horse, Palatine, was spooky in the arena. The U.S. team had led after the compulsory exercises, but then dropped to third place after the fall, behind Germany and Austria. Other U.S. team members were Blake Dahlgren, Annalise Van Vranken, Mary Garrett, Mari Inouye and Emily Hogye. 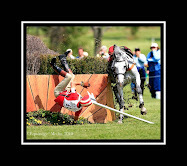 The team longeur and horse trainer is Carolyn Bland. 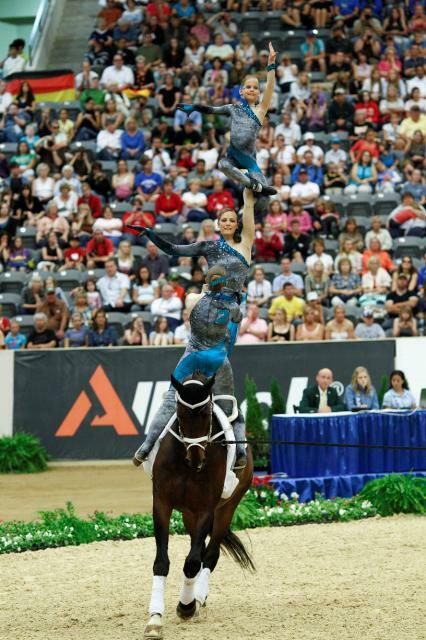 The experienced team previously won the 2010 United States Equestrian Federation/American Vaulting Association national title. 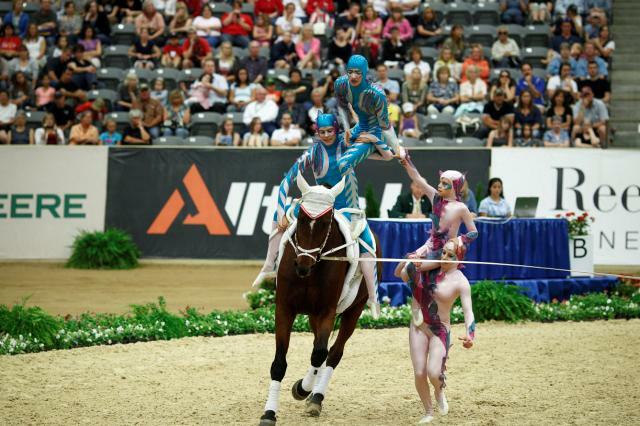 Members of this team were also on the 2006 World Equestrian Games silver-medal team and the 2008 bronze-medal team in the World Vaulting Championships. 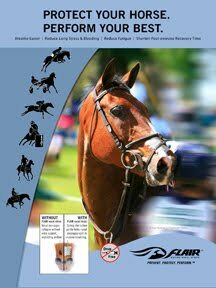 Maitozo was the individual gold medalist at the 1998 World Equestrian Games. Germany, which had been leading going into Sunday’s freestyle, suffered a fall in the performance but still had a strong enough composite score (8.010) to earn the silver medal. Germany vaulted aboard Adlon, a 15-year-old Brandenburger, and the longeur was Alexander Hartl. Austria turned in a vigorous freestyle performance, set to the music of Cirque du Soleil, to earn the team bronze medal ( 7.990). 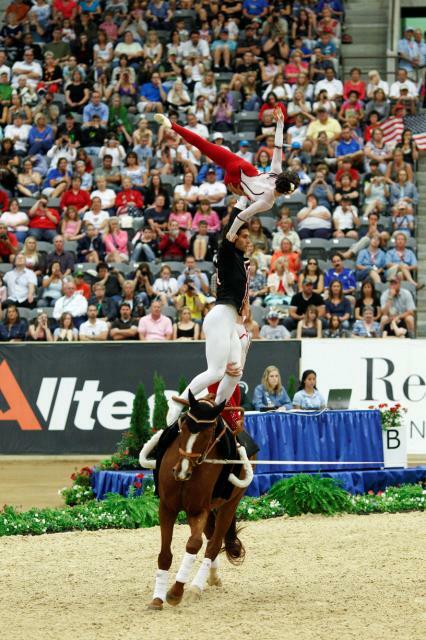 The Austrians were vaulting on Elliot 8 and, and the longeur was Klaus Haidacher.